As the week of Herman's release, reindictment and death clearly illustrated, the most important battle IS in the court of public opinion. We resonated with the words of Michelle Alexander, author of The New Jim Crow in response to the Federal Courts reversal of a positive ruling on Stop and Frisk. As with Stop and Frisk, public consensus is key in the struggle to abolish solitary confinement and like Stop and Frisk, public consensus on solitary confinement is shifting in a major way. "This is a major setback for the crusade to end stop-and-frisk. I had the sinking feeling that the decision in this case was too good to be true, and it appears the federal appeals court may be poised to unravel the progress that has been made. Ultimately, the most important battle is in the court of public opinion. As I've argued in my book, victories obtained in courtrooms are easily undone if no public consensus has emerged in support of them. A major shift in public consciousness is required...This fight did not begin in the courtroom and it will not end there. Much work remains to be done." 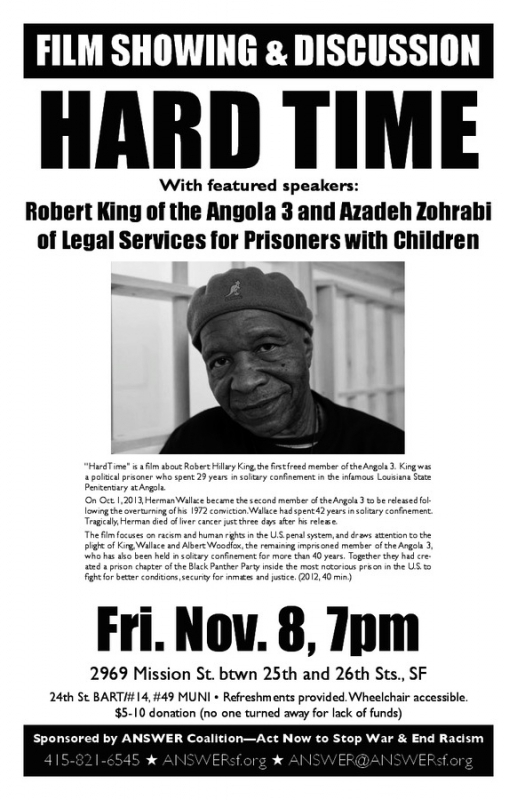 This November 8 event is at 7pm, at 2969 Mission St. between 25th and 26th Streets. Refreshments will be provided. Wheelchair accessible. $5-10 donation (no one turned away). 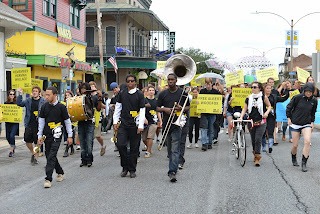 ANSWER has been a staunch supporter of Angola 3 efforts since 1998. Back in 1972 they were also present at the first hearings. Thanks to ANSWER for their years of dedicated support. As you may remember, Albert's first hearing seeking to bring an end to the inhumane, abusive, and illegal routine strip searches he is subjected to daily was postponed. Now, after months of legal wrangling, next Wednesday, November 13th at 9:30am he finally has his day back in Court before Judge Brady in the Louisiana Middle District Court in Baton Rouge. Albert will be present and will testify. The hearing is open to the public and supporters are encouraged to attend. With any luck Albert and his legal team will convince Judge Brady to uphold the consent decree that came out of a 1978 lawsuit Albert himself filed and won -- establishing such searches as illegal, unconstitutional, and against internal prison policy. 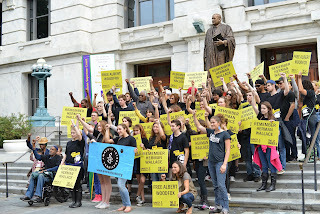 On October 21, we joined Amnesty International in delivering 50,000 signatures demanding Albert's release to Governor Jindal's office. Amnesty is still continuing their campaign, so if you have not done so, please sign the petition now and share it! 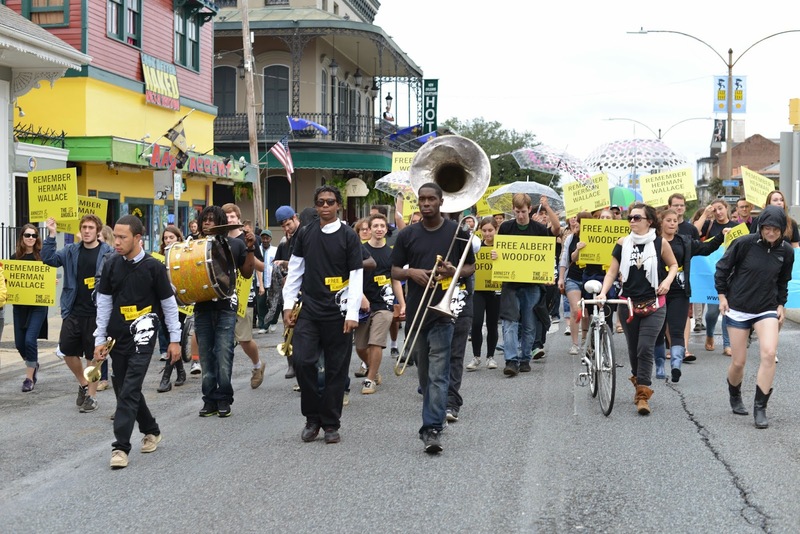 In New Orleans on Oct. 19, Herman Wallace's life was celebrated with a second line, organized by Amnesty International and the A3 Coalition. --View all the photos here. 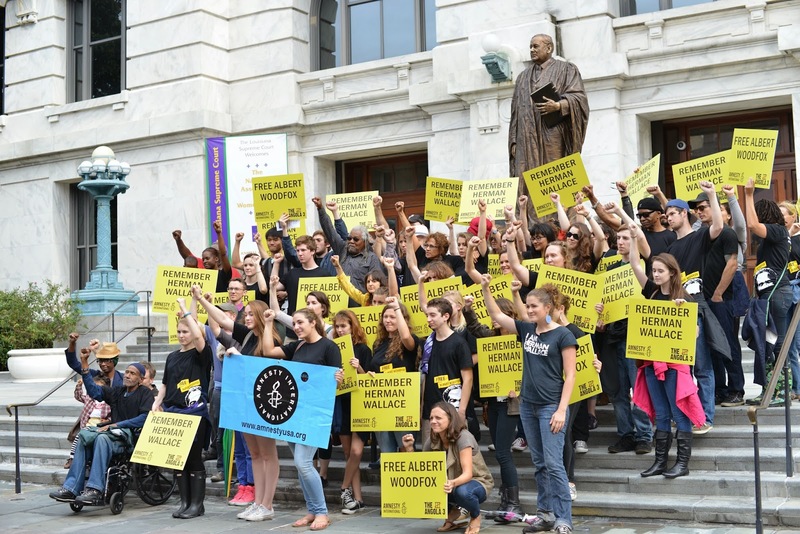 --Read the Huffington Post article entitled "What I Learned From Herman Wallace: Black Panther, Political Prisoner, and Friend"
On October 21, A3 supporters joined Amnesty International and the A3 Coalition on the State Capitol steps in Baton Rouge, Louisiana, and demanded the state drop its latest attempts to keep Albert Woodfox incarcerated and not appeal against Albert's recently overturned conviction. Among those who spoke at the event were Jasmine Heiss of Amnesty International, longtime A3 supporter Malik Rahim (in photo on the left), Albert's brother Michael Mable, Rev. Dr. Patricia Bates, and Robert H. King (in the top photo). Former A3 investigator Billie Mizell read a message from Teenie Rogers, the widow of slain prison guard Brent Miller: "Each time I look at the evidence in this case, I remember there is no proof that the men charged with Brent's death are the ones who actually killed him. It's easy to get caught up in vengeance and anger, but when I look at the facts, they just do not add up." I am firm in my resolve to continue the fight to address the horrors of long term solitary confinement in a meaningful way. 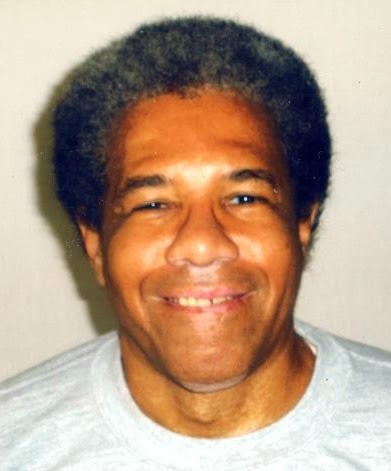 The plight of the Angola 3 has shined a disinfecting light on this terrible, unconstitutional practice of indefinite solitary confinement without meaningful due process reviews. This past summer, I joined the prominent Ranking Members of the Full House Judiciary Committee and relevant subcommittee Ranking Members in asking the Department of Justice to examine the practice in its use in Louisiana jails. We are continuing to monitor the situation and promise all of you assembled today that the sacrifices of the Angola 3 will not be in vain. We will continue to fight to ensure that prisoners are dealt with in a manner that is consistent with the constitution and I am currently exploring transformative legislation on this very topic. I look forward to partnering with you all to ensure that this story is told and will use my position on the House Judiciary Committee to make certain that we serve the interests of justice. Thank you all for your hard work on this issue and please know that my office stands as a resource to those fighting for justice. 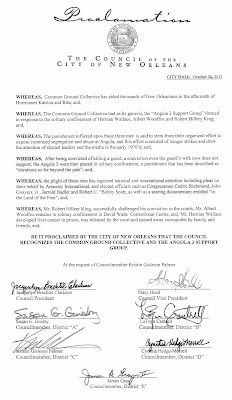 Malik Rahim, co-founder of the Angola 3 Coalition and Common Ground was presented with a Proclamation by the New Orleans City Council recognizing the role Angola 3 and Common Ground have played in the city. 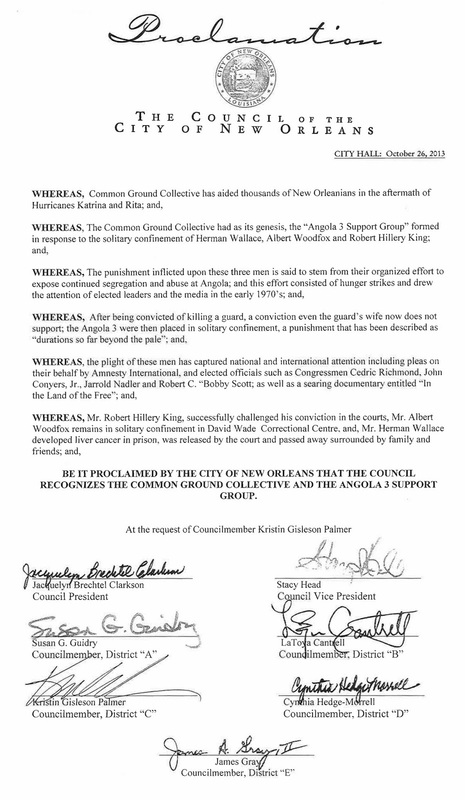 The proclamation was presented during the 47th Black Panther Party Alumni Reunion. --Click on the image above to read the full proclamation.